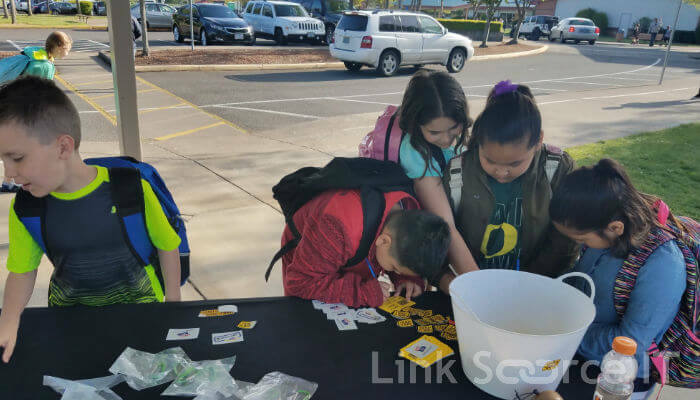 Link Source IT is a proud participant in the 2018 Oregon Safe Routes to School program. 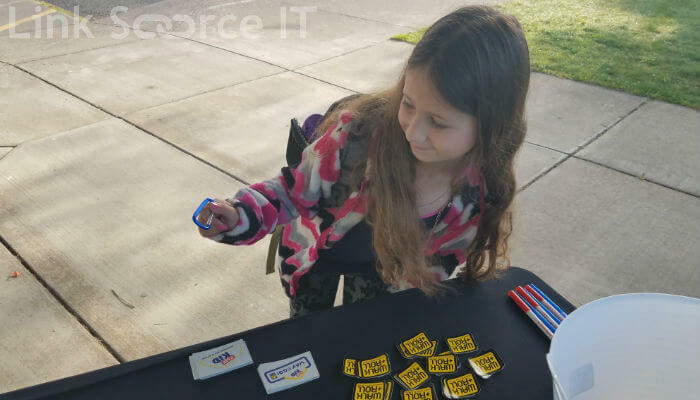 This year, we helped encourage K-8 students at Meadow View School to WALK+ROLL to school! 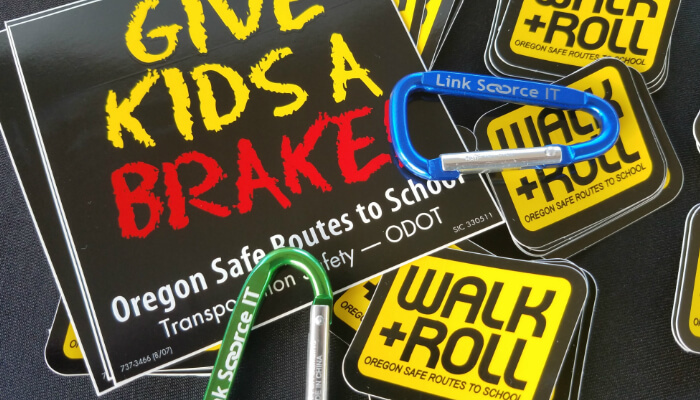 The WALK+ROLL program, overseen by Oregon Safe Routes to School, helps create safe, convenient, and fun opportunities for children to walk, bike and roll to and from school. Kids that walk and bike to school are healthier, happier, and often do better in school. 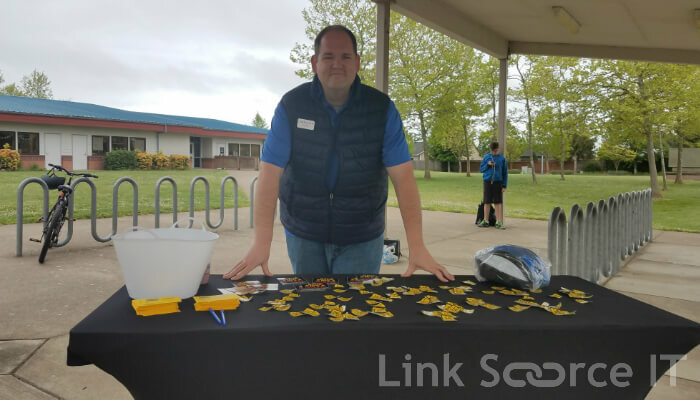 Link Source IT is committed to helping educate our local community. Students visit the WALK+ROLL table to register for prizes and collect some Link Source IT swag. Working alongside other participants like Lane Transit District, volunteers helped students plan safe routes through their neighborhoods for their commute to school. By walking or rolling to school, students were entered into raffles for prizes like scooters and bike helmets. And each day they got different prizes at the registration tables like stickers, books, carabiners and safety lights. Students, staff and volunteers learned about the Six E’s, which aims to accomplish more than just fixing sidewalks or working with law enforcement. It is important to consider all aspects of creating safer streets. Encouragement: A little encouragement and inspiration goes a long way to getting kids and families interested in walking and biking to school. Education: For programs to be safe and effective, children must be educated! Ideally, education programs should include driver safety campaigns for the entire community. Enforcement: Partnering with local law enforcement ensures that traffic laws are obeyed near schools and adjacent neighborhoods and helps build safer streets. Engineering: The physical environment can improve the safety of our streets. Complete sidewalks, crosswalks, bike lanes and paths can all contribute to the success of Safe Routes to School programs. Equity: Diverse communities experience different challenges and opportunities. It is important to understand cultural, social, economic and language differences in varying places. Evaluation: Successful Safe Routes to School programs monitor and document their outcomes on a regular basis. Sharing data can help inspire other programs, find additional funding, and garner further support for kids walking and biking to school! Tim Bess manning one of the registration tables. Just as kids learned to find safe routes to school, it’s vital for organizations and users to create safe digital routes for their information. Here are ten key ways to make sure your online privacy is protected. Encryption is really just a way to obscure your data so that prying eyes can’t access it without a key. Encryption should be a MUST on any mobile device such as a phone, tablet or laptop. Over 10,000 devices are lost or stolen in airports each week. Link Source IT can help you keep your devices secure, even if they’re out of your possession. Phishing attacks, in which criminals disguise their malware as legitimate communications are a massive cybersecurity risk. Ransomware, a type of malware that locks users files and demands monetary payment to unlock them, is on the rise with a reported case every 40 seconds. Of every hour. Of ever day. Such attacks usually spread through malicious email attachments and links, a practice known as phishing. So make a rule of not clicking on anything when you do not know where it will take you, even if it appears to come from someone you know. Link Source can arm you with anti-phishing software as well as user training to ensure your employees are savvy about what’s legitimate and what’s not. Many browsers now feature a private or incognito browsing mode. This feature is great for not keeping web history stored in your browser, but it is hardly an invincible way of web surfing. Remember that your web traffic has to flow through your Internet Service Provider (such as Comcast or Verizon) and may also hit firewalls, routers, switches and proxy servers depending on the type of network you’re using. Using private mode while connected to a Starbucks’ free Wi-Fi is not going to shield your traffic from the ISP and whomever manages the Starbucks network, let alone criminals who may have attempted to gain access to an unsecured wireless hub. Private mode also doesn’t stop websites from tracking and collecting data on you. Hyper Text Transfer Protocol Secure (HTTPS) is the secure version of HTTP, the language your web browser uses to talk to the websites you visit. That extra S at the end of HTTPS means that all communication between your device and the website is encrypted. Typically, HTTPS is used to protect confidential transactions like online banking or places you’d enter a credit card, like Amazon. Without the S, anyone could potentially have access to view standard HTTP traffic. Most, if not all, web browsers will display a small padlock icon in the address bar to visually indicate that a HTTPS connection is in effect. HTTPS Everywhere is a browser plug-in for Chrome, Firefox and Opera that will force HTTPS-enabled sites to run in secure mode instead of using only HTTP. Your critical files should be stored in the cloud somewhere. For most individuals that may be with Google Drive, Dropbox or some other cloud storage location. For business, however, freebie cloud solutions are not often ideal. These services are great for mass-dumping files into a storage folder, but retrieval and wide scale restoration of files can be a nightmare, especially if you’re trying to recover database-specific files such as Exchange or SQL. Our team of information management experts can connect you with enterprise-grade backup and availability options that ensure your business succeeds. If you missed our article on Passwords and Multi-Factor Authentication, be sure to check it out here. Multi-Factor Authentication, or MFA, ensures that your information cannot be accessed with just a password alone (easily hackable). By adding a second (or third) layer of protection, such as security questions, you’re exponentially increasing your level of safety. And in fact, you’re already using many forms of MFA in your daily life. When you use your bank’s ATM, you’re providing both something you have (your debit card) with something you know (your PIN). MFA can help decrease your risk of identity theft online because even if a criminal were able to obtain your username and password, they would still be lacking the second piece of information. Google offers two-factor authentication for their accounts, as does Yahoo and Outlook. Technology Is Fast. Your Protection Should Be Faster. Link Source IT is committed to helping you anticipate business challenges before they become business problems. Reach out to us today for a free risk assessment or to learn more about enterprise-grade protection at small-business friendly prices.